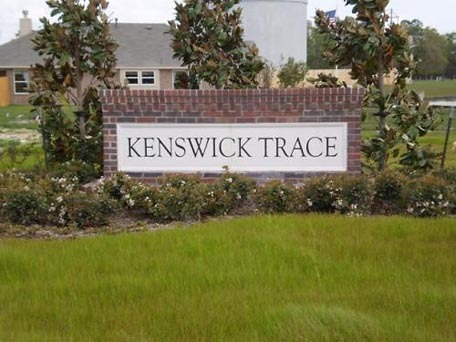 Kenswick Trace is a growing community in Humble conveniently located off Lee Road near FM 1960. Residents enjoy easy access to Intercontinental Airport, shopping, restaurants and Jesse Jones Park. The community will consist of 94 homes when construction is complete. The Association has overcome a few challenges. The original developer was a victim of the economic downturn and the unsold lots were taken over by the bank and then FDIC. Devon Street Homes was actively building in the community and stepped in to purchase the lots and ensure the continuing growth of the community. Home sales are rising and the community is estimated to be completed by the end of 2015. The Association owns a small parcel of land in the community that is currently utilized as open space. Several residents recently volunteered to spearhead a Capital Improvement Committee with the goal of exploring the possibility of adding play equipment to the space. They will be looking at different equipment that may fit that space and working with C.I.A. Services to see how the price of the proposed equipment will affect the finances and assessments of the homeowners. Residents have banded together to plan community events and promote a sense of pride in their community. They have taken the time to get to know their neighbors and be involved. C.I.A. Services is proud to be entering our 6th year as the management company for Kenswick Trace. We look forward to seeing the changes ahead for this dynamic community.